Supplies: Curtains from this post. This pretty fabric was from a clearance curtain. It didn't have another set so I made it a dress, but didn't want to wear a tube dress so I finished it as a skirt. It turned out quite lovely, would look great at a wedding or reception dress. The beautiful gem necklace was handmade from Saressa. 1) Cut fabric to desired length. 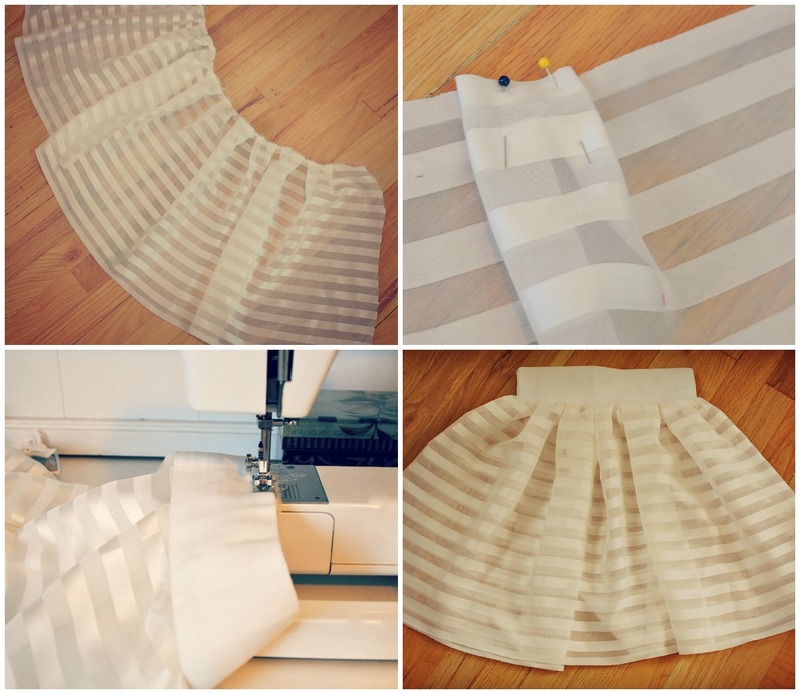 Measure out enough to make a full skirt (based off your measurements). 2) Pleat by sewing folds back and forth evenly along the waistline like this. 3) Once folds are all sewn along waistline, sew elastic band right sides together with pleated skirt. You will have to pull the elastic to fit. 4) Sew the back seam up. Finish hem if needed. Lovely!!! It's a very cute skirt. You're talented. The skirt is lovely! so girly, you're sooo talented! So cute, such a professional look and all from a net curtain. Brilliant! This looks so good, cant believe its a curtian. just stumbled across your blog and you are amazing!! you have mad skills, dear. this skirt is awesome! You are amazing!! I would love to buy something like this!! Do you sell on etsy? Hi Jess. I do have an etsy shop, if you could email that would be best for a custom order. laurazpifer@gmail.com, I could sell you this one if it fits your measurements. Very cute. I noticed in your video that your thread cone is upside down. Any reason ? I would love to visit my blog!. This skirt looks really great. Does it have lining or is it another strechy skirt down there? Thanks!